Chaplains are the visible presence of the holy in what may seem like unlikely places. ELCA federal chaplains serve in federal prisons, Veterans Administration hospitals, and the armed services of the United States. Although the venue may be different, federal chaplains have many of the same responsibilities as any other ELCA pastor. They preach the gospel, lead worship, administer the sacraments, perform weddings, counsel, teach and bury the dead. The work is alike but not alike, for there are many more memorial services for younger adults. Grief counseling is also proportionally more frequent for the federal chaplain. What is the mission of the Bureau for Federal Chaplaincy Ministries? “To support the chaplaincies of the church in federal agencies, institutions and armed forces, and to provide for the pastoral care of those called to these ministries” (excerpt from ELCA Bureau for Federal Chaplaincy Ministries mission statement). Military chaplaincy is a specialized ministry. It demands physical fitness as well as mental and spiritual fitness. Chaplains must also complete a six-week officers’ training program. The chaplain is then commissioned as a First Lieutenant with a three-year special call. Unlike other ministry programs, there is an age factor in qualifying for military chaplaincy. Although the average age of a civilian pastor today is approximately 44, the upper age limit for clergy entering the military is 42. Training usually occurs very early in a pastor’s career. Obviously, this requirement holds back many second-career pastors. An applicant for chaplaincy must have earned a Master’s of Divinity degree and have completed an additional two years of professional service. Chaplains are the only military personnel who do not carry firearms and are not required to qualify in their use. Those interested in military chaplaincy are encouraged to visit the chaplaincy websites for the three different branches of the U.S. armed forces: Air Force, Army and Navy (which includes the Marine Corps and Coast Guard). ELCA clergy also serve and minister in the Bureau of Prisons and the Veterans Administration system. To serve as a chaplain in one of these specialized ministries requires a special call or endorsement from this church. 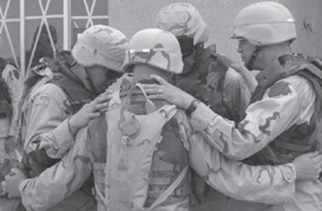 How can we support chaplains and those in the military overseas? Above all else, keep the ELCA chaplains in your prayers and in the prayers of your congregation. If you are interested in praying for ELCA chaplains by name on a rotating basis, call the ELCA Bureau for Federal Chaplaincy Ministries at 202-417-3692. Orchestrated drives to collect and send gifts to our military are discouraged. The most helpful thing a congregation can do is to write letters to those deployed. Donating purchased calling cards, which enables military personnel to call home, is most appreciated. Members can also give generously to the ELCA, which supports the work of the Bureau for Federal Chaplaincy Ministries. The Bureau also gratefully receives gifts designated for specific ministries. From these gifts come kits for military field worship, education opportunities for chaplains and other ministry enhancements.